Customer Successes! | JUJAMA, Inc.
“I would like to congratulate for this amazing product “JUJAMA”. I love it and would like to convey my best wishes to the whole team of JUJAMA. Thank you to your team for your support in helping us pull off another successful event! We appreciate all of the hard work your team puts into the desktop/app and are especially grateful for your attentive (and always quick!) customer service. This year we had our most confirmed meetings to-date! Dave- thank you for making the trip out to San Jose and for manning our info desk & partnering help desk. We can’t thank you guys enough for all you do for us. Congratulations to all our #EventProfs and their teams for all their successful and outstanding events! 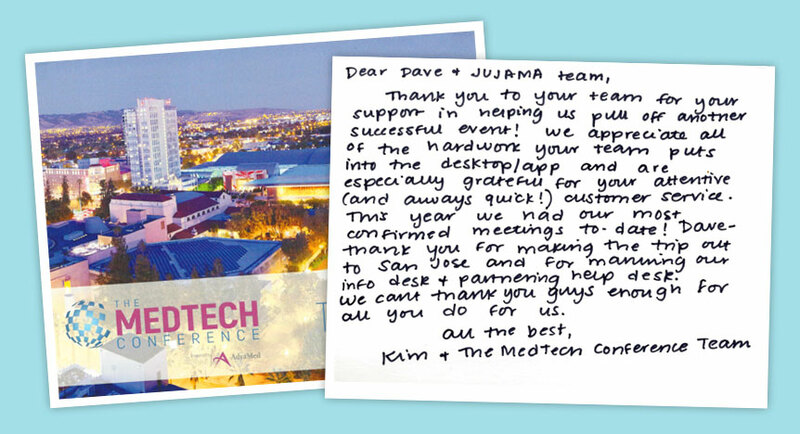 Click HERE to learn more about what JUJAMA can do for your mobile conference apps, desktop event apps, trade shows & more!